The Luangwa Valley is one of Africa’s prime wildlife sanctuaries, with concentrations and varieties of game and birdlife that has made it world famous. 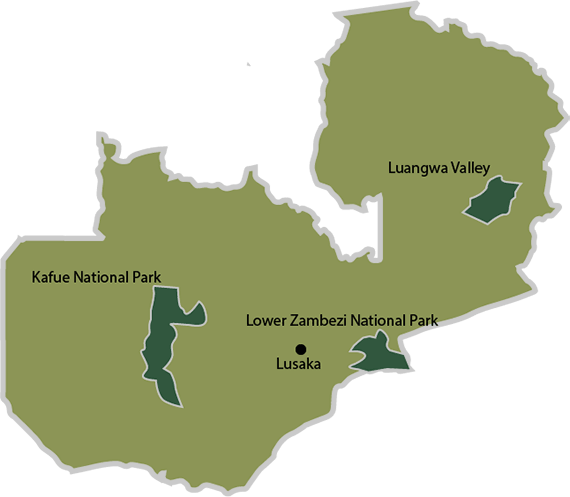 The Luangwa Valley lies at the tail end of the Great Rift Valley as the Rift reaches Zambia, it divides; one arm to the east encompasses Lake Malawi and the western arm becomes the Luangwa Valley. Down the center of the valley flows the Luangwa River, fed by dozens of sand rivers that come down during the rainy season. The development of game protection in the area began in the late 19th century when British South Africa Company was administering the territory and they imposed a total ban on the hunting of hippo and elephant in the area – Today there is an over-abundance of hippos along the Luangwa River. We hunt predominantly in the Luangwa Valley, the block lies between the North and South Luangwa National Parks. Climate: Zambia‘s climate is generally sunny and pleasant. June and July are the middle of winter and are in general cool to mild. The average morning temperature in Winter is 50 degrees F and in the afternoons between 72 -77 degrees F (October) November through to March which are our summer months are warm and some days are very hot. Our Hunting areas: Hunting takes place in the Luangwa Valley , Kafue Flats, Zambezi Valley and Bangweulu Swamps in governmental conservation areas or large privately owned ranches, depending on the required species. Health and safety: Fully equipped medical kits and telephone (Satellite phone) or radio communication are available in case of an emergency. Zambia is a high-risk malaria area, we suggest you consult your medical practitioner or travel clinic and take the necessary precautions. Always carry your travel and personal documents, travellers’ cheques and cash on your person or ask us to keep it in safe custody. Travelling, accommodation and meals: Please make provision for all accommodation and travel expenses before and after your safari as this is not included in your contracted Safari. Upon your arrival in Zambia, you will be welcomed by our staff at the nearest port of entry(airport) to the hunting area and transported to Safari camp/lodge by either air charter or ground transport. Depending on the required species and hunting areas, you will be based in a comfortable grass thatched lodge or tented camp. Linen and basic toiletries are provided. All meals, soft drinks and daily laundry (except on travelling days) service are provided. Customs, visas and insurance: Customs clearance is operative at your port of entry into Zambia . Zambia requires a passport valid at least 6 months beyond your departure date and depending on your country of origin, a visa. Insurance for personal effects, luggage and trip cancellation as well as medical casavac is strongly recommended. A visa can be obtained at the airport on arrival. There is also a $20 departure tax when leaving Zambia. Firearms and ammunition: A firearm import permit is required for Zambia . Once your Safari is booked we will get all the necessary permits and clear your firearms on arrival. Currency & Spending money: The local currency is the Kwacha. In general cash is preferred. It is customary to tip staff in recognition of good service. During June / July we recommend you bring gloves and a beanie. Packing, dipping and shipping of trophies: An import and export CITES permit for Appendix I and an export CITES permit for Appendix II animals are required for each shipment. Field preparation of trophies are done in camp and transported to a shipping agent designated by the outfitter. Clients will be put in touch with the shipping agent to discuss their requirements and arrange for the payment of services. Clients should have sufficient trophy tags and full shipping instructions handy and should make sure that their skinning instructions are clearly recorded in the outfitter’s hunting register.